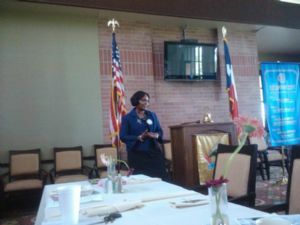 Fellow Sunrise Rotarian, Lameka Washington gave her classification speech on being of service and giving back to God and community. She spoke of how her childhood years formed her into the person she is today. After many years working in corporate America, she decided it was time to set off in her own business as a Mary Kay consultant. She gave the history of Mary Kay and how it has influenced her life to be more and do more for others.